I flat-out loved this book! Seriously, I would totally marry this book if I could. It starts off with our young star in a sticky situation from which she must be rescued. She got screwed out of an apartment in a faraway college town and is left sitting on the side of the road (literally). Her mom phones an old college friend who lives nearby and said college friend sends her son Matt to pick up Julie. Matt lives with his mom, Julie’s mom’s college friend, Erin, his dad Roger and his sister Celeste. Erin tells Julie she can stay as long as she wants. In exchange for the free room and board, she would like Julie to spend her afternoons with their 13-year-old Celeste, who has a few… quirks. But what struck Julie the most about Celeste had to do with what—or who?—was in the chair next to her. “Oh, Julie! I didn’t introduce you properly, did I?” Celeste chirped happily and then turned to the seat next to her. “Flat Finn, this is Julie. Julie, this is Flat Finn.” Erin poured herself some sparkling water, and Roger continued daydreaming about brine, but Julie was sure she heard Matt catch his breath. She eyed the seat again. Frankly, she’d been hoping to get through dinner without addressing this issue. No one else had mentioned anything so far, but this must be what Matt had started to tell her about: A life-size cardboard cutout of their brother Finn leaned stiffly angled against the chair, his gaze fixed rigidly on the ceiling’s light fixture. Along with Celeste’s cardboard stand-in for her older brother Finn, who is traveling the world on adventures and volunteer missions, Julie must deal with Erin and Roger who spend more time at work than they do at home with their family and Matt, who wears dorky geek t-shirts and spends his time either at school or at home working on his computer. Julie finds herself drawn to Celeste and her odd companion and wants to help her become less shy around other people, and to act more “normal” around her classmates and teachers. But nobody will tell Julie anything about the life-size Flat Finn. Matt just keeps telling her to leave the whole subject alone. Even Finn, who Julie flirts with via email, won’t tell her about his cardboard counterpart. The characters are real people who I would totally hang out with after school. They are well-rounded and believable people in an odd situation. Though I’ve never met someone who had a stand-in family member, I can imagine that this would be how they would act. I really came to care about these people and wanted to genuinely know what happened to them. The dialogue was also very real, though Park had a tendency to run questions together which I found a bit distracting. Instead of asking a question and waiting for an answer, several times 4 or 5 questions would be lumped all together. There was definitely an element of mystery here, as in WTH is up with Flat Finn? At one point, I thought I had it figured out, then I was wrong, then I knew what was going on, then I didn’t. It was fun to try to understand everything without having all of the clues. There was romance in spades here, but I can’t really tell you about it without giving some secrets away, so just trust me on this one. 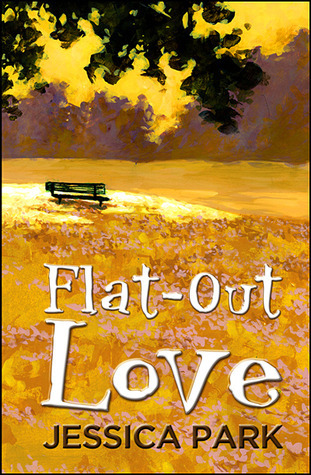 The Sum Up: Flat-Out Love has becomes one of my favorite books. It has everything I’m looking for in a book: unique plot, interesting and relatable characters, fun dialogue and lots of romance. This needs to be on your must-read list pronto.